Full contact training. Do you do it? Why? 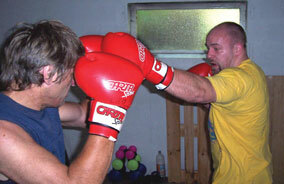 Do you practice full contact training (sparring/ partner drills) and why do you practice them? Another post got me thinking that people probably train this way for a variety of reasons, and I was just curious to hear some to expand my own knowledge base. I did do it and it was good for increasing realism and instilling the chaos of it all. It does take its toll on the body through and it’s not something that can be done regularly. Fear of the consequences of a mistake can also hamper the development of skill if it’s done too much i.e. people won’t try to improve things they have not yet got down if they get punched hard in the face for every error. It’s also not suitable for those who are older, have health issues, and who have professional jobs. School teachers and bank managers can’t be turning up to work with black eyes and fat lips. The full contact stuff was always done away from the dojo for those who wanted to do it (picture of me and Fred doing some full contact sparring a few years ago). It was never mandatory. In my teaching we spar “all in” but safety and control is emphasised. I once read a quote from Brendan Ingle in a boxing magazine where he said, “The only time people should get punched hard in the head is when they are getting paid millions of dollars for it”. That’s resonates with me these days :-) He always encouraged controlled sparring and it certainly never adversely affected his fighters. In short, I feel it has value, but it’s not mandatory and it should not be the only way people spar. Lighter sparring can better develop skill, pads are designed to be hit hard, and there are other ways to develop “heart”. My club has a lot of big hitters and I dread to think of the blood bath that would ensue if I told them to forgo control when sparring. In really limited quantity, and with armor. Beyond that, taking a bunch of seasoned Karateka and saying 'hit each other as hard as you can' is kind of crazy...might be fun for a while, especially when young enough to recover, but long term it's something to do in very limited doses, IMO. Of course this begs the question what is meant by full contact, just doing drills or hard sparring to me is not 'full contact', to me it means going at someone the way you approximately would in a real situation...there is no reason way to do that safely without armor..in fact, IMO you can't really even 'spar' that way, sparring by necessity involves concession for safety in terms of pacing, contact level, and context. from a Kyokushin point of view... hard sparring, yes. Full on battering each others heads in, no. The only time that happens is at the tournament. As said above, we all have to go to work the next day. this covers your thighs, body and sides of the head and allows you to move around.